A series of tests have been organised since early 2015, and the Dutch forces announced yesterday that the results had been good. DUTCH POLICE ARE adopting a centuries-old pursuit to resolve the modern-day problem of increasing numbers of drones in the skies, becoming the world’s first force to employ eagles as winged warriors. “It’s a low-tech solution to a high-tech problem,” police spokesman Dennis Janus told AFP as officers and their feathered friends gave their first public demonstration of their birds’ prowess. The eagles will now be launched whenever drones are believed to be posing a danger to the public, such as during sensitive state visits or if the remote-controlled tiny craft are flying too close to airports. The aim of the tests was to determine the best way to bring down the drones. “None of the eagles were hurt, but as for the drones, none of them survived,” said Janus, brushing aside concerns from animal rights groups. The eagles see the drones as prey and intercept them as they are flying, before landing where they feel safe with the drone still in their claws. Dutch police have now purchased their own birds, which have reached five months old, and will be deployed as needed alongside more traditional four-footed recruits, dogs and horses. 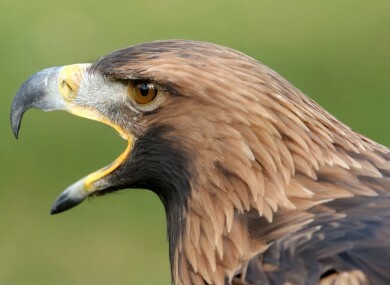 About 100 police officers will be trained in working with the eagles, and the Dutch “flying squad” with its own birds of prey could go into action next summer. In the meantime, the police will be using birds supplied by a specialist company Guard From Above. As in other countries, increasing numbers of drones are invading Dutch skies raising concerns in places like airports and restricted, sensitive areas. “We haven’t found any other method to intercept the drones, but we are continuing to explore other possibilities,” Janus said, pointing to such things as nets or finding ways to electronically take the drones over. Read: Who wants to see a video of Donald Trump cowering in front of a bald eagle? Email “Dutch police have started using eagles to take down drones ”. Feedback on “Dutch police have started using eagles to take down drones ”.